As a world leader in managing the care of very sick people, Ken Hillman’s breakthrough methods of treating critically ill patients have become the gold standard in Australia, the U.S. and Europe. His job is about keeping people alive, but he asks us to question whether that’s always a good thing. 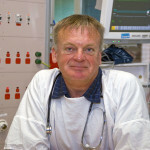 Ken Hillman is Professor of Intensive Care at the University of New South Wales. He graduated from Sydney University and worked at St Vincent’s Hospital in Sydney before continuing his training at St Bartholomew’s Hospital in London. He was Director of the Intensive Care Unit at Charing Cross Hospital in London, before returning to Australia, where he is an actively practising clinician in intensive care at Liverpool Hospital in Sydney. He has published over 150 peer reviewed articles as well as writing many chapters and edited several books. Ken has written a book, ‘Vital Signs’, aimed at the lay public on what really happens in intensive care. He is about to publish another one on ageing, dying and death.